Alice (Tina Majorino) falls down a rabbit hole, and finds herself in Wonderland, a fantasy land of strange characters and ideas. Woody Allen's Best Dramatic Movie. 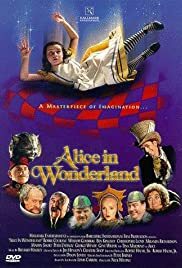 Best Shrunken Person or Person under 1 ft.
Alice is in Looking Glass Land, where she meets many Looking Glass creatures and attempts to avoid the Jabberwocky, a monster that appears due to her being afraid. Alice stumbles into the world of Wonderland. Will she get home? Not if the Queen of Hearts has her way. In Victorian England a bored young girl dreams that she has entered a fantasy world called Wonderland populated by even more fantastic characters. An American spends his holiday in Ireland, where he is introduced to the world of magical creatures like leprechauns and fairies. In a subplot, a forbidden love story blossoms between leprechaun Mickey and fairy Jessica. An Englishman returns after nine years abroad and tells strange stories of the tiny people of Lilliput, the giants of Brobdingnang, the flying island Laputa and the Houyhnhnms, a race of intelligent horses. Alice (Tina Majorino) follows a white rabbit (Kiran Shah) down a rabbit-hole into a whimsical Wonderland, where she meets characters like the delightful Cheshire Cat (Whoopi Goldberg), the clumsy White Knight (Christopher Lloyd), the rude Major Caterpillar (Sir Ben Kingsley), and the hot-tempered Queen of Hearts (Miranda Richardson), and can grow ten feet tall, or shrink to three inches. But will she ever be able to return home? A Masterpiece of Imagination. . .
Mock Turtle: When Griff and I were little, we went to school in the same sea. And the master was an old turtle; we used to call him "tortoise." Alice: Why would you call him tortoise if he wasn't one? Mock Turtle: We called him "tortoise" because he "taught us." The Gryphon: You ought to be ashamed of yourself! Asking a simple question like that. Curiouser and Curiouser Cried Alice ! What could have been a magic Alice using the formula of top Stars in the cameo roles as in the 1933 version, is dulled by excessive length and an unnecessary sub plot, concerning Alice's shyness in performing a song for a family gathering. Also combining scenes from Through the Looking Glass while pleasant in themselves, extends the running time, and the pedestrian pace of the film. Sure there are some magic moments, and fortunately the designers have called upon Sir John Tenniel's illustrations for their characters, and the dialog when it is from Lewis Carroll's text is happily nonsense. It is bits that are not by Carroll that detract sadly. 4 of 6 people found this review helpful. Was this review helpful to you?